Soffit & Fascia Repair | Pro-Line Contractors, Inc.
Pro-Line is here to help you with your soffit and fascia repairs on your home. Your soffit is a very important part of the house that is often overlooked. Many homeowners don’t realize it even exists. Look up under you roof you’ll notice a tiny section of “ceiling” between your home and the edge of the roof. That is your soffit. This small area is necessary by design to allow water to fall off your house away from your siding or into the gutter. Most of the time, the rain won’t even hit the house because of this efficient architectural design. The edge rim of the soffit is your fascia. Having fascia installed by the professionals is very important as well. Knowing a job is done right the first time will be reassuring to you knowing that your home is safe. Without properly installed soffit and fascia, or regular soffit & fascia repairs, this small section of your home becomes a perfect spot for small critters to dwell and many make it into attic spaces and in between walls! Let the experts at Pro-Line inspect and repair and soffit or fascia because there is nothing more aggravating then trying to do a complicated repair on your home by yourself. 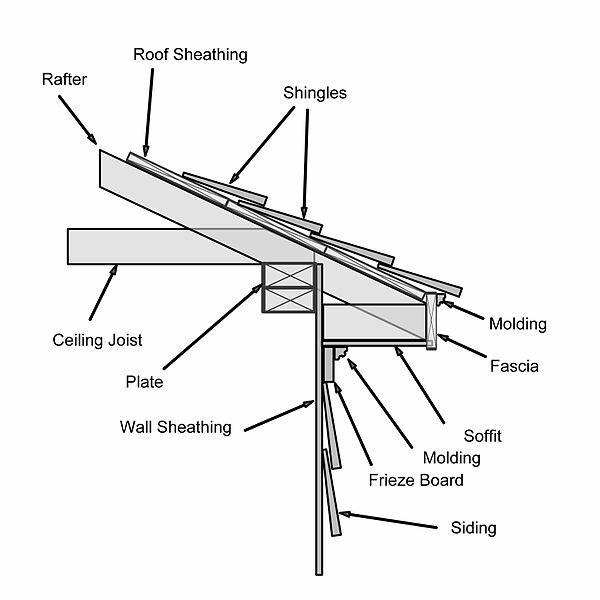 Be stress free and call Pro-Line for fascia and soffit repair on your home. When installing soffit on your home you want to make sure it’s done by professionals. The supplies that are purchased are not precut and need to be customized on each house. Replacing your soffit usually costs about $25 to $30 a linear foot installed, while replacing your fascia costs about $20 to $25 a linear foot installed. Living in Illinois, we have quite a bit of wildlife roaming around our neighborhood. Either they’re looking for food or shelter. The place wildlife feels safest is in the darkness, so we suggest shining a little light at night with properly installed eco-friendly lights in your soffit paneling. This will keep away nighttime pests like raccoons and coyotes. And maintaining a well-lit property is a key deterrent to prevent burgarly. Make sure proper actions are made with signs of wear and tear. If mold and mildew become present the under lining, the roof might be overrun with mold and mildew. We are forced to keep up with our homes with these drastically different seasonal weather conditions in the Chicagoland area – freezing cold to sweltering hot – our houses are left to warp and literally move before our very eyes. We recommend giving us a call every couple of seasons to insure your roof, soffit& fascia, and your entire house isn’t to going to have any further extensive damages due to normal “wear and tear” from our crazy seasons. While we are checking out your soffit & fascia, we might as well shed a light on your roof repairs, windows, patios and other maintainance as well. No matter what size, shape or style of your home, upkeep with these little areas goes a long way. Clean and upket soffit and fascia can make a house look beautiful and healthy. Contact us today.